What would you do if your customers were declining steadily? If you are a serious organisation that is unafraid to listen to its shortcomings, you would have conducted a CSS – customer satisfaction survey. 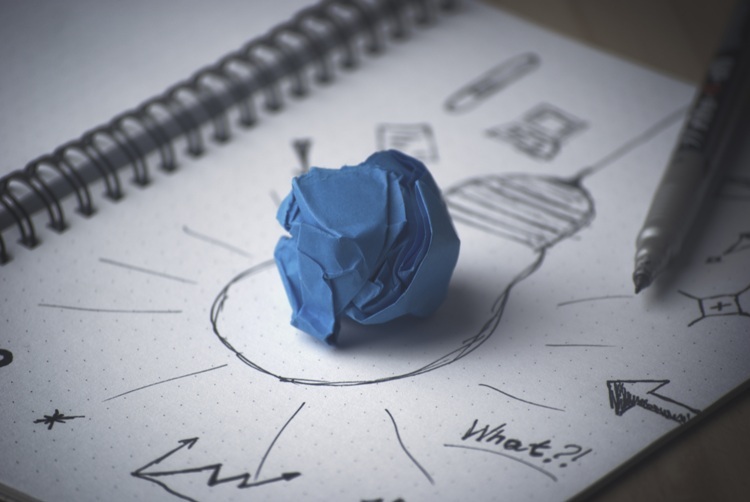 So, what should you do if retaining the right employees is your challenge? Conduct an ESS – employee satisfaction survey. At Yellow Spark, we believe people make businesses successful. But people, are becoming hard to retain, and this was a feeling echoed across organisations we consulted. It is safe to say that the days when employees stayed in the same job for most of their lives, is long over. What we see today are quick turnarounds of people, actively moving toward better opportunity and quicker growth, especially if they feel a cultural dissonance with the organisation. When the people of an organisation keep moving out, it’s time to worry… because without stability, seldom will organisations see steady long-term growth. Hence, we wanted to help organisations retain their employees and ensure at least certain levels of job satisfaction. We decided to address this issue and came up with a survey to understand what exactly it was that the employees were feeling; what is preventing them from being as productive…consequently hampering the growth of the organisation. This prompted us to design an index called the ‘Organisational Success Quotient’ to help organisations predict their success based on what goes on in their workplace. The index constitutes of 10 intangible aspects of working in an organisation. The survey was answered by respondents on a four-point scale – Strongly Agree, Somewhat Agree, Somewhat Disagree, and Strongly Disagree. Our sample set represented a cross-section of companies ranging from those with turnover more than 100 Crores to those under 10 Crores; some companies were under 10 years while some were older… In terms of industries, IT & ITES, media and entertainment, and banking constituted almost 50% of the respondents. Moreover, the survey represented diverse voices within the organisation, like top management, women leaders, and even junior level employees. After reaching a sample size of 100+ responses, we are now ready to share our findings on the key challenges organisations in India face today… Successfully overcoming these obstacle areas may just help them rocket to a whole new level of success! One: Employees don’t leave organisations but leave each other. Our data found that the reasons employees part from organisations are essentially because they feel the organisation lacks a sense of fairness, and lacks an enabling environment…both eventually resulting in employee dissatisfaction. The research further showed a clear disconnect between the perceptions of managers and employees in this regard. For instance, 33% of managers strongly agreed that their organisation exhibits a sense of fairness, while less than half (14%) employees thought the same. This disconnect is probably the primary cause for lower level of employee retention in an organisation. It is thus natural that if the perceived sense of fairness is low, employees will not be happy and job satisfaction will also be low. But apart from the obvious, these findings also show that processes in such organisations are either not well defined or not adhered to. For example, managers may have certain discretionary powers that are perceived as unfair. Management needs to put a feedback mechanism in place to know what employees are feeling. Deploy all channels for employee feedback, including appraisals, grievances mechanisms, exit interviews and treat all employee feedback seriously to take on the challenge of retention and address it head-on. Two: Our data showed that women and men clearly have different perceptions of the workplace. For instance, let us look at how leadership is perceived by both women and men. Women tend to be more positive of leadership than men on few points like clarity on organisational goals and correlation of their efforts with the goals. 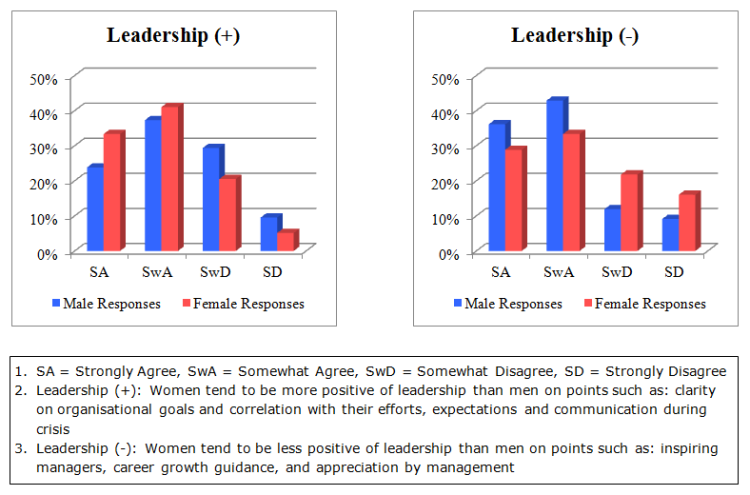 At the same time women tend to be less positive of leadership than men on points like managers are inspiring or appreciation from their manager. Gender is a complex issue within a workplace. The perception of Gender discrimination is more than having a heathy number of women in workplace, or celebrating women’s day, or defining a sexual harassment policy. It is more about women employees being treated at par, by allowing them to take decisions independently, rewarding their efforts, and giving them the freedom to use their understanding of the big picture to aid organisational growth. Three: Young organisations are agile and flexible while older organisations are bureaucratic. Pockets of data revealed specific traits in new organisations (those under 10 years) and older organisations (those that were 10 or above). We clubbed the differences to give it a shape and one of the groupings is organisational culture i.e. policies and norms set by leadership. Data revealed that young organisations exhibit few qualities like transparency, learning mindset, and considerate towards employees little more than older organisations. What is striking is that these qualities and a few more like instant gratification, tech savvy, and respect for work rather than age or authority…, all better appreciated by millennials. Millennials – as also seen in this survey – are equally distributed across the two types of organisations. But, probably, younger organisations are changing with the times faster. Is it a co-incidence that young organisations exhibit the millennial qualities more than the older organisations when more and more millennials are joining the working population? The younger organisations seem to have embraced these qualities even though they have people from all age groups. The older organisations seem to stick to the ways that worked for them ignoring the values of the new workforce. About the research: At Yellow Spark, we believe people make businesses successful! Yellow Spark Solutions LLP designed and initiated this survey to gain insights on what really matters to employees at their workplace. ← Are You the 4th Team Player?